By about 200 BC, the Kyrgyz people were living north of China, in central Siberia. Like other people of north Asia, they lived in yurts and rode horses. They were not very powerful, and came under the control of first one, then another stronger neighbor. In the 300s and 400s AD, the Rouran ruled the Kyrgyz. In the 500s and 600s AD, the Gokturks ruled them. The Kyrgyz converted to the new religion of Islam when enthusiastic Muslim traders came through Kyrgyz land travelling along the Silk Road in the late 600s AD. In the 700s, the Uighurs defeated the Gokturks and took over control of the Kyrgyz people. When the Uighurs converted to Manichaean Christianity in 762 AD, that probably didn’t help them get along with the Muslim Kyrgyz people any better. But in 840 AD, the T’ang Dynasty of China hired the Kyrgyz army to fight with them against the Uighurs. The Kyrgyz, under their leader Jordan, destroyed the Uighur empire and killed the Uighur Khan, Oge. This time, the Kyrgyz managed to keep their independence, and they set up their own kingdom -Kyrgyzstan – in the Tien Shan mountains north-west of China. They kept Kyrgyzstan an independent Islamic kingdom for 350 years. About 1200 AD, Genghis Khan and the Mongol empire conquered the Kyrgyz and made them part of the Mongol Empire, along with practically everybody else living in Asia. 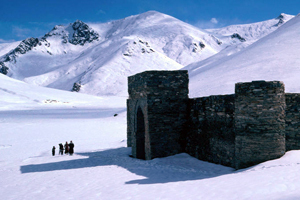 The Kyrgyz continued to maintain their part of the Silk Road through the Middle Ages. Kyrgyzstan may have been where the Black Death – the bubonic plague – first got started in the early 1300s. Cite this page: Carr, K.E. Who were the Kyrgyz? Medieval Central Asia. Quatr.us Study Guides, May 31, 2017. Web. April 24, 2019.